We arrived in Portland last night around 8 PM, after two flights and over 6 hours in the air. Christmas eve lunch in the Dallas airport was only surpassed by the wonderful Christmas eve dinner we had at the IHOP near the hotel. We stayed at the Embassy Suites in Portland as we knew they had breakfast and this would not put us in a situation of trying to find food on Christmas morning. The Christmas morning breakfast can be summed up in one word.....and that word is "complimentary". 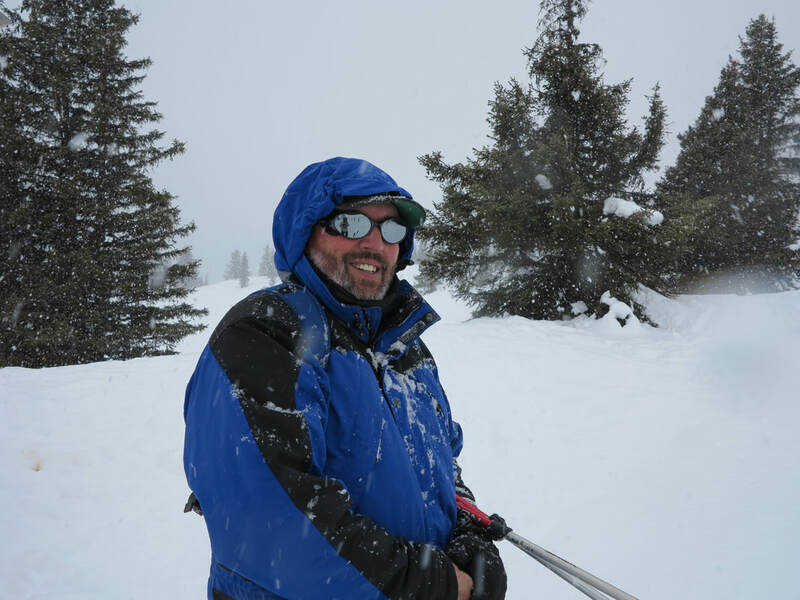 After all of these wonderful gastric adventures, we headed out into the wilds. We left Portland in our rental car and decided to take route 4 through Washington, traveling down the Columbia River. I did some research and none of the 3 routes were very scenic. 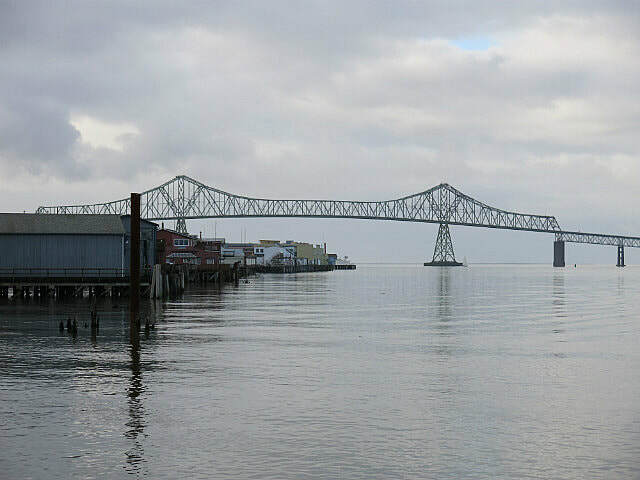 By taking route 4 through Washington state, we crossed the Columbia river at Astoria, Oregon. We did see a few interesting things along the way, one of which was a herd elk that I spotted up a valley in the middle of nowhere. They were about 1000 meters up the valley and I was surprised that I not only spotted them, but knew what they were from that distance. 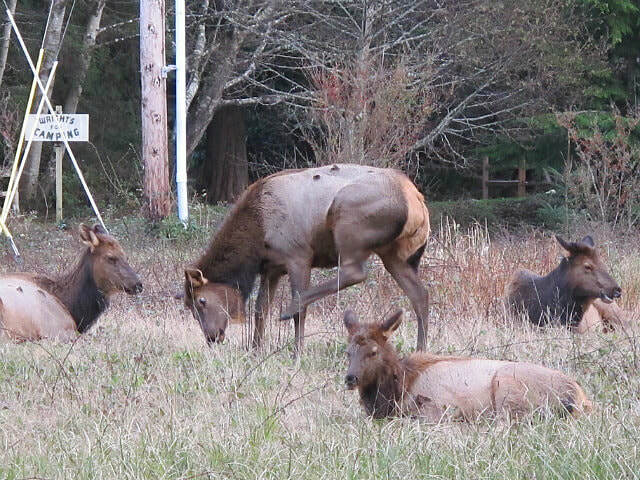 I had never seen elk in the wild before. We were able to drive a small road up the valley to a few hundred yards from them. Laurie also was fascinated with the trees and fauna of the area. There are ferns everywhere, and moss and lichens cover many of the trees, almost like they're wearing a coat. When the rain is still on the trees and the sun shines, they almost glow. The valley is different from other places we have traveled, like a rainforest, but cold. Huge trees and wildlife were everywhere. 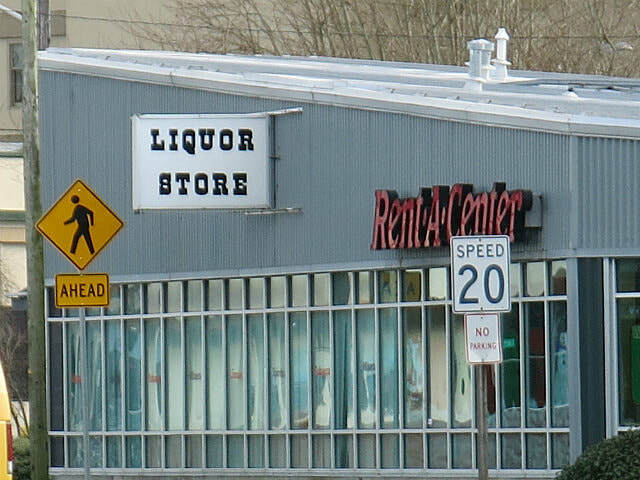 One stop shopping. All your bad decisions in one place! 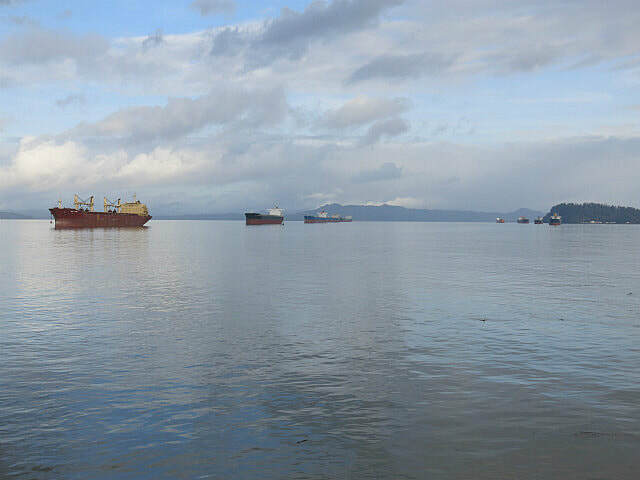 Ships lined up at the mouth of the Columbia River. We crossed the river and drove around a bit in Astoria, an old working waterfront town that has of course changed with time. Old canneries no longer open dot the waterfront, along with fishing boats, and a gang of tankers lined up to head out to sea. It's pretty, and a nice small town. While most things weren't open on Christmas day, the downtown is obviously trying to make up for the closed canneries and lost lumber jobs by catering to the tourists. There were many restaurants, gift shops, theaters, and such. A street car with it's own generator! A cool ride along the Astoria waterfront. 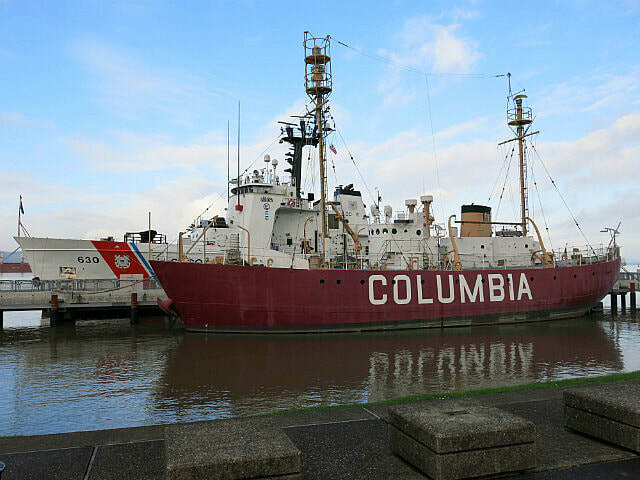 The Columbia lightship. These were used in place of lighthouses back in the old days. 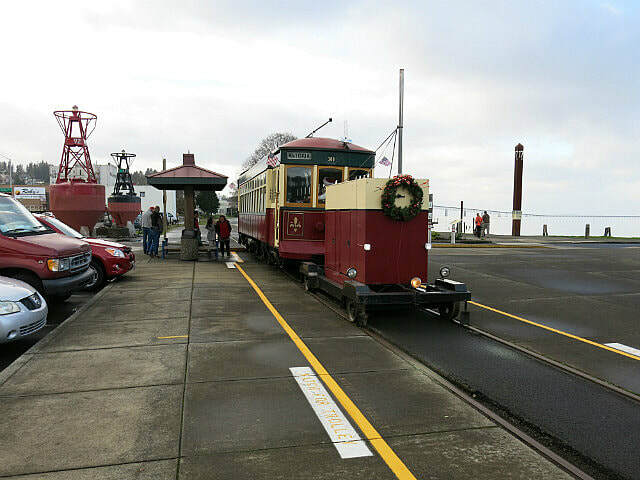 Astoria has an old trolley traveling the waterfront to haul the tourists. It is a genuine antique electric trolley, but there are no wires overhead. This was remedied by the trolley towing it's own diesel generator. Adaptation at it's best. There was also an interesting looking museum on the Columbia River.....closed on Christmas of course. No surprises there. We didn't expect places to be open. From there, we headed south on the 101. The Astoria waterfront is dotted with old, no longer operating canneries. The town is working hard to draw tourist into the area to replace an industry changed by time. We had not yet seen the Pacific Ocean. We were driving and saw a sign for Delray Beach. It turns out it's one of the few places you can actually drive a vehicle out on the beach! Having driven the beaches of North Carolina for 20 years, I was very leery about driving our Nissan Altima rental car out on the sand. 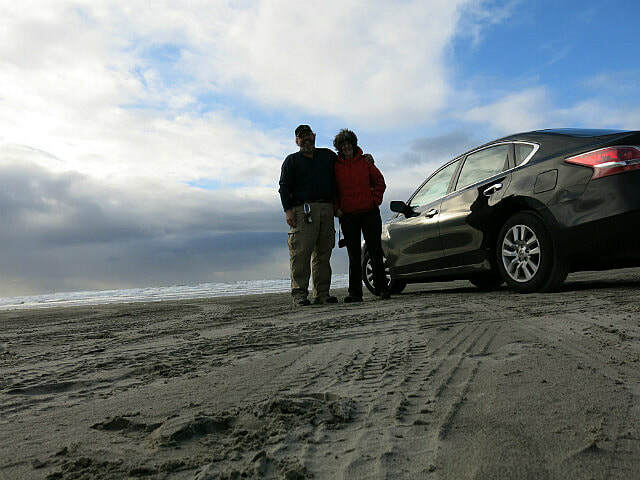 It turns out that the beach was very firm and we drove out for a picture or two and to see the ocean! Laurie was kicking about a dead sea critter and wasn't paying attention.......her boots are presently drying by the heater. They call them "sneaker waves" out here. We continued our journey southward and stopped in the community of Seaside. It is, from what we've read, the nearest beach community to Portland, and it's where a lot of Portlanders spend summer weekends. We got there to find that even on Christmas day when most things are closed, a tourist trap is still a tourist trap. There were a few decent places, but it was full of t-shirt shops, bumper cars, skeeball, and stores selling crappy trinkets made in China. Even on Christmas day, the town was full of horrid tourist drivers. We witnessed one trying to angle park in a parallel space, and another trying to back into a space and crash into the truck behind him. I personally thought he was traveling a bit too fast for parking.....and apparently his skill level wasn't up to par either. I said to Laurie "let's get out of here. This isn't what we came here for." And we left quickly. THIS is the Oregon we came to see. 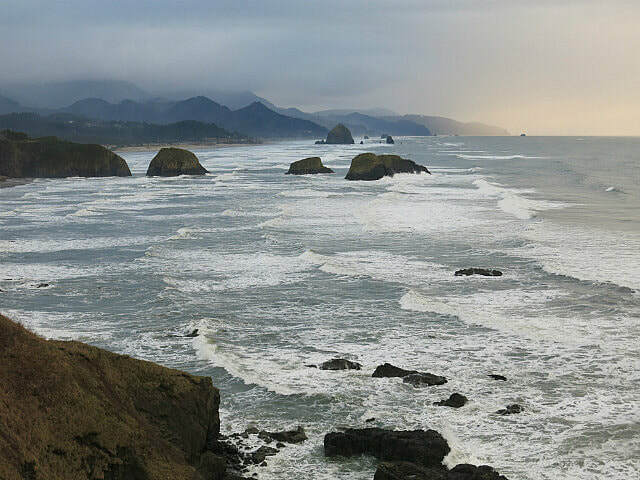 Cannon Beach, Oregon. 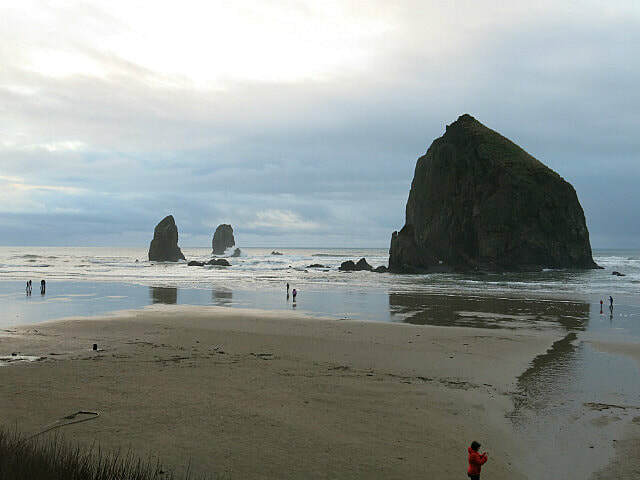 ​Our next stop was Cannon Beach, Oregon. 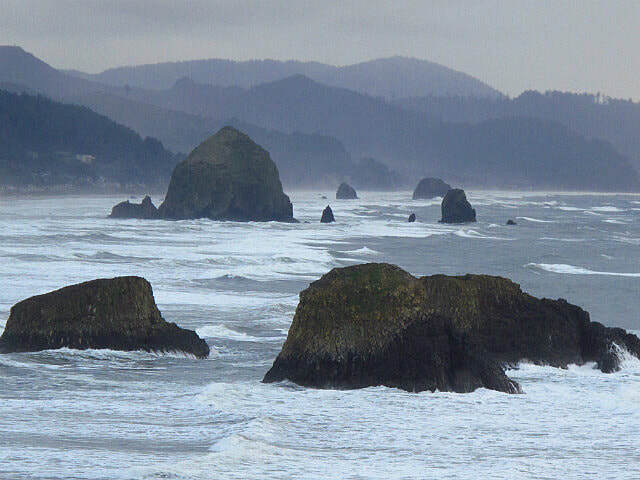 We went to the state park here to view the "haystack" rocks and the coast. Upon walking to the edge of the bluff and looked down the coast, I said to Laurie "THIS is what we came for". It was a breathtaking view, of mountains sloping down into the sea. Personally, I cannot imagine why anyone would spend time in the town with t shirt shops and bumper cars, when this is mere miles down the road. 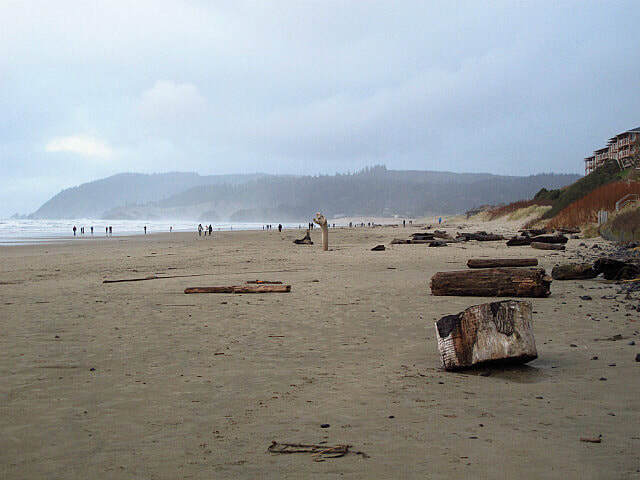 We were in no hurry to leave Cannon Beach. It looked like what we thought Oregon would be. The days are not long here, with sunup at 8 AM and Sundown at around 4:30 PM. We ran out of light before we ran out of things we wanted to see. We wound up having dinner at a small seaside cafe called the Sand Dollar Restaurant and Lounge, one of the few restaurants we had found open. We figured that it would be marginal as it was open on Christmas evening.....and lucky for us, we couldn't have been more wrong! The food was fantastic, with fresh seafood and superb made from scratch sides! We couldn't recommend the restaurant more highly. 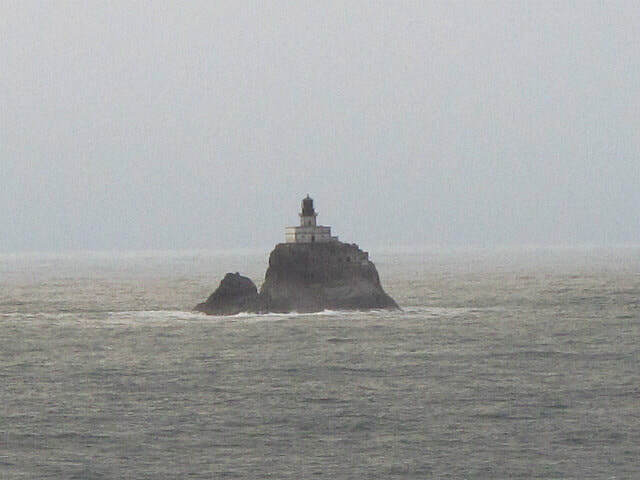 Tillamook Rock Light. VERY difficult to reach, and has been shut down for decades. ​We're staying in an old time mom and pop hotel on the beach. You still have to have a real key to open the door! I'm sure the view in the morning will be amazing. We expect tomorrow to show us more amazing views....along with a cheese factory! On to Tillamook!